← It’s Official – Caprese Restaurant to Close Saturday 26th February 2011 Forever…. Last week, we were visited by one of our customers, Vivienne Nicoll who writes for the Glasgow Evening Times, who was interested in doing an article about the forthcoming closure of The Caprese. Vivienne has been a customer for years and felt that our little restaurant closing down after 26 years deserved a mention in the newspaper. Today she is featuring Costanzo and the long battle he has fought to retain the restaurant. Tomorrow will feature our Star Diners! Thank you so much for your article Vivienne, not to mention the huge photograph of Costanzo which takes up most of the page! An eyesore site which has blighted Glasgow’s premier shopping street will finally face the bulldozers after seven years. It will usher in the arrival of a new multi-million shopping mall in Buchanan Street. In February, the owner of a popular Italian restaurant will lock up for the last time, ending a legal battle which has raged for over a decade. The decision by Caprese owner Costanzo Cacace to sell up means that just weeks later, the bulldozers will finally move onto the prime site at the corner of Buchanan Street and Bath Street. The derelict building opposite Buchanan Galleries, which has trees growing from the roof, will be replaced by a new mall. Developer Land Securities is hoping to lure chic new retailers into the complex. The development could also include housing, a leisure complex, hotel, restaurant, cafe and pub. The city block has been at the centre of countless legal battles with the properties’ owners and potential developers all fighting aspects of the new scheme. In 2004, Glasgow councillors gave Atlas Developments permission to build shops, offices and 85 flats on the site. A rival developer challenged that decision and on three occasions the row ended up in the Court of Session in Edinburgh. In 2006 it reached the House of Lords which backed the council decision to appoint Atlas as developer. But further problems arose as the businesses in the block bounded by Buchanan street, West Nile Street and Bath Street had a large number of owners. The council failed to get them all to agree to sell up and in 2007 made a compulsory purchase order in an attempt to get the development moving. 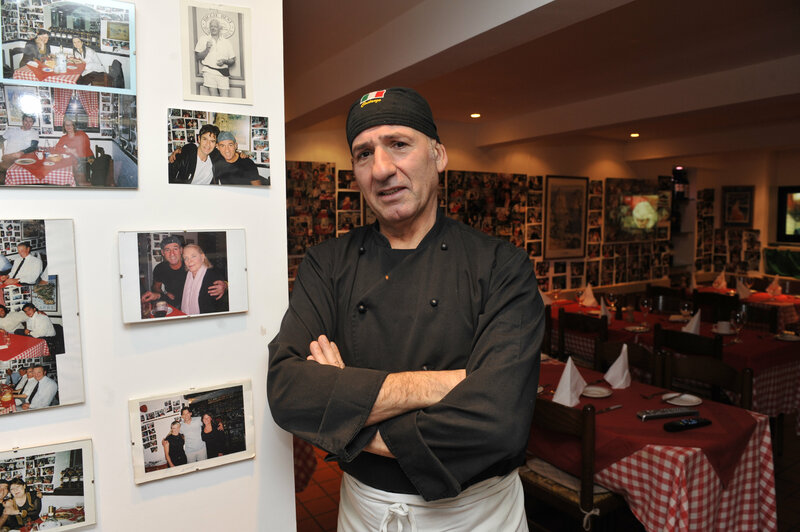 A number objected, including Mr Cacace, who opened his basement restaurant in 1984. He claimed Atlas had attempted to reduce the value of his property by failing to take steps to maintain it. Mr Cacace initially fought the bid to have him forcibly ejected, insisting he would take his battle to the European Court of Human Rights. But he has now told the Evening Times he will close for the last time on Saturday February 26 and walk away from the building for the last time. Mr Cacace will move his business to a new restaurant, called Don Costanzo, in Woodlands Crescent. Mr Cacace, 60, said: “I have been here for 26 years – this is my life. “I have been in and out of different courts fighting the compulsory purchase orders and it has cost a fortune. “I have also been in limbo for 14 years, never knowing what was going to happen the following day. Mr Cacace added: “Some people thought I should be happy because I had made a profit but money isn’t what drives me. “When I moved in in 1984, this part of Buchanan Street was just waste ground and people didn’t give me six months before I went bankrupt. “I created something which would provide a future for my family and children. “That cannot be replaced. This restaurant is my baby and is priceless to me. Land Securities, which also owns Buchanan Galleries, are revealing little about their plans. He revealed work will start early next year, although it is understood demolition could begin as early as March. Glasgow council leader Gordon Matheson, who represents the city centre, welcomed the fact work will start next year. He said: “This block is key in terms of the next stage of developing retail and office space in the centre of Glasgow and I am delighted work will soon begin on this extremely important site. “Its completion will make Glasgow city centre even more attractive to shoppers, visitors and potential developers and investors. “The completion of this block can only raise the reputation of Glasgow – and the Style Mile in particular – to new heights. “There are other major developments planned for this part of the city centre. 2 Responses to Costanzo hits the headlines!